What models and metrics are used to measure Community Noise Exposure? What can I learn about Sound Perception and Hearing? What has been done to reduce Aircraft Noise? What are the Federal Aviation Regulations that deal with Aircraft Noise? How does Weather affect Aviation Operations? What Aviation Noise Sources Exist? How does Noise affect People? How does Noise affect Domestic Animals and Wildlife? What Can I Learn About Airports? In this section of NoiseQuest, you will find videos on operations, information on types of airports, as well as information about Air Traffic Control. Cargo Service Airports are airports that serve aircraft carrying only cargo, with a total annual "landed weight" of 100 million pounds. "Landed weight" means the weight of aircraft transporting only cargo. 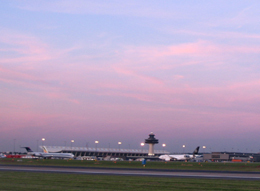 An airport may be both a commercial service and a cargo service airport. Reliever Airports are airports that relieve overcrowding at commercial service airports. These airports provide you with greater access to air transportation and may be publicly or privately-owned. General Aviation Airports include the remaining airports. This airport type is the largest single group of airports in the U.S. system. WHAT IS THE DIFFERENCE BETWEEN LARGE AND SMALL AIRPORT OPERATIONS? Overall Traffic Volume: An airport's size may dictate its traffic volume. Large airports support large volumes of traffic. This high traffic volume can result from commercial carriers that operate to and from large airports. More traffic can also result if an airport is used as a hub for a passenger carrying air carrier offering scheduled passenger service, such as Delta, or a cargo carrier, such as UPS. Night Traffic Volume: An airport that is a hub for a cargo carrier will often experience a significant amount of night traffic. For example, UPS, based out of Louisville, will fly packages overnight, sort the packages, and send them out again before morning. Therefore, Louisville International can expect a large amount of night traffic. Day Traffic Volume: An airport that hosts primarily passenger carrying air carriers can expect more traffic during the day. Daytime flights, as opposed to late night flights, are more popular with travelers, including business people and tourists. In addition, an airport that hosts a hub for a passenger carrying air carrier will experience more traffic due to an increased number of transfer flights. For example, United Airlines is based in Chicago at O'Hare International. United does not have direct flights from San Francisco to Indianapolis. Therefore, a flight from San Francisco to O'Hare may carry people transferring to a flight from O'Hare to Indianapolis. 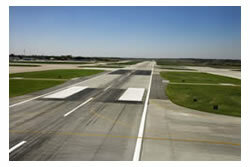 Aircraft Size: Larger airports can accommodate larger aircraft such as those used for commercial operations. These airplanes require more runway and larger ramp space. Therefore, they must fly into and out of airports with larger square footage. Larger aircraft often, but not always, produce more noise than smaller aircraft. Air Traffic and Aircraft Size: Smaller airports typically receive more small propeller-driven airplanes than the larger jets. Also, these airports generally support a smaller amount of traffic than larger airports. Added Airport Services: Some small airports make use of Fixed Base Operators (FBO). An FBO is a business that is granted the right by the airport to operate on its property and provides such services as maintenance and fuel to aircraft that pass through the airport. Many FBOs also offer flight training to the community. These training facilities increase traffic due to training flights. However, this traffic is different than commercial traffic. Training aircraft are small, single engine propeller planes that often stay near the airport in a designated training area or in the pattern doing touch-and-go landings. 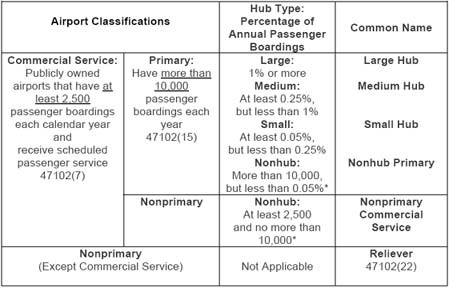 Aircraft Type: Smaller airports are more likely to receive smaller charter service aircraft. These air carriers take customers to places that commercial carriers do not typically serve. Charter air carriers generally account for only a few arrivals and departures per day. However, they are becoming more popular. Since daily activity at small airports can vary, the noise levels will also vary. A local airport benefits a community by increasing convenience and helping the local economy. Emergency Support Services: Convenience and quicker response time are especially important in emergencies. For example, during a natural disaster much needed supplies can be delivered in hours instead of days. Food, blankets, generators, vaccines and emergency personnel can be quickly sent out from the airport. A local airport reduces the time it takes to get to and from the airport in times of crisis. Tourism: Flying directly into a town, with no additional travel required, increases convenience for prospective tourists. More people may be able to visit the area more readily. Tourists stay in local hotels, eat at local restaurants, spend money in local stores, and attend local events. Sales tax from these purchases goes to local and county jurisdictions. Unique Community Services: Most local airports are home to a Fixed Base Operators (FBO) that offers flight training to the local community. Many people who live near an airport have had the opportunity to train for and receive their pilot licenses through a local FBO. This allows people to realize the dream of flight. For definitions of words used in this section go to the NoiseQuest Glossary of Terms.